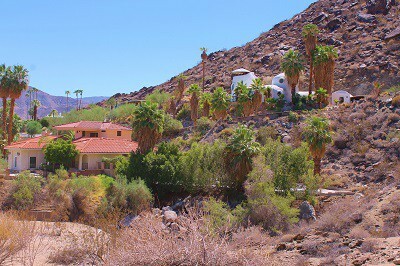 Parc Andreas is a small gated luxury home community set in one of the most beautiful areas of South Palm Springs. Most of the homes in this highly desirable neighborhood, were built in the late 1980’s on large lots in mostly desert contemporary style. These masterpieces play home to full-time residents and snowbirds alike, offering privacy and spectacular views of the San Jacinto Mountains that are hard to match. Though tranquil in its setting, Parc Andreas offers its residents many chances for recreation. Private tennis courts, nearby hiking and horseback riding trails, walking paths, the Indian Canyons Golf Resort . . . there is something for everyone’s pleasure here. Parc Andreas is ideally situated close to downtown Palm Springs, the shops on El Paseo and the Palm Springs International Airport. Entertainment for all ages can be found close by, including fine dining, cultural museums, art galleries, boutique shops and a wealth of indoor and outdoor activities. It is also easy and convenient to access the Interstate 10 freeway and Highway 111 from Parc Andreas, which leads to all other Desert Cities. Most of the 144 homes in Parc Andreas are custom homes, built in the late 1980’s. Square footage runs from approx. 2,500 to 4,400 sf and are on lots ranging from approx. 11,800 to 21,400 sf. These homes were built to capitalize on the privacy offered by their tranquil Indian Canyons location and the 360 degree mountain views that are as spectacular as can be found anywhere else in Palm Springs. People who like Parc Andreas also tend to enjoy Andreas Hills, Araby Cove, Alta and Canyon North.